The Mugger, the most snub-nosed of the crocodiles, ranges all across the Indian peninsula and Burma, crossing the open ocean to reach Sri Lanka (Ceylon). The animals were formerly revered, and there are a number of temples in which large specimens are still kept and regularly fed offerings. Like most other crocodilians, this species is probably endangered, but we know very little about the number that currently survives. 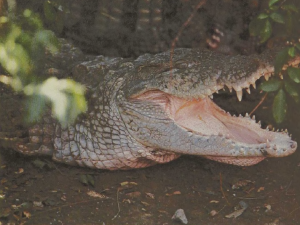 The Mugger belongs to those crocodilians, like the Gavial and most other large crocodiles, that hide their eggs in a sand or gravel bank adjacent to the water. In contrast, some of the smaller species, as well as the American Alligator and, curiously enough, the saltwater crocodile, embed their eggs in a mass of rotting vegetation, which they collect and assemble adjacent to the water.